It is certainly no secret, that the DDH (otherwise known as Duck Man and the most honorable president of Duck Power Incorporated) is often the unfortunate target of my taunts, jokes and other assorted abuse. This is not to say, I hold any ill will toward the man, it is simply the way the male species bonds and displays their admiration for other members of the sporting tribe. As DDH pulled in the dooryard, I could hardly contain my excitement as I waited to unveil my latest practical joke. Though fully expected not to have quite the same humor level as the now infamous "wader" incident, the angst of the duck hunting opener, the exposure of West Grand, the brutality of the bronze back adventure or last season's forays to the hard water I still hoped that my latest attempt at poking fun at DDH would at least have smile cracking potential. To best understand the jokes "practicality" one must be provided with some background. You see DDH is the proud papa to two beautiful little girls. Now these two have seen fit on occasion to glamorize and fashionize DDHs sporting equipment. These "upgrades" run from red ribbons tied on duck decoys, naked Barbies hidden in his hunting coat pocket and the book "My Little Ponies Rescue Fairy Town" stuck into his backpack. 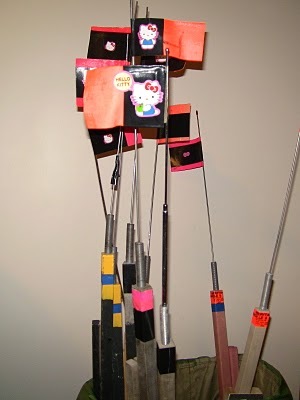 The latest accessorization incident occurred a few weeks ago, when DDH realized that all his ice-fishing traps were sporting "Hello Kitty" stickers. A blog post alerted me to this fact and provided me with all the ammunition I needed. After DDH managed to settle in and relax, I knew his guard was down so I started to slowly build my "case". I carefully spent several minutes showing off my various models of "critter getters", including the wounded woodpecker, rabbit and squirrel I mentioned to DDH that I had a "special" contraption guaranteed to bring the coyotes running I had fabricated especially for his visit. As DDH's finely honed crap detector began to anticipate "trap" and his spidey senses reached their tingling climax, I knew it was THE moment to strike and I unveiled "Hello Kitty". To try and explain DDHs reaction would prove difficult.Though I did manage to provoke a grin from him resembling that of a Halloween Jack-o’-Lantern, I think he failed to see the humor in my actions or the critter getting potential of my latest and greatest creation. As I attempted to relay these facts, DDH pulled an icy cold one out of his pocket, eased down on the couch, turned a deaf ear to my taunts and began reading "My Little Ponies Rescue Fairy Town". So are you going to mass market the Hello Kitty coyote catcher?! Poor DDH, at least it takes it like a man should. Trey . . . I appreciate your support of my abuse, I can see we are like minded by our coordinated attacks on DDH. PTO . . . mass marketing . . . hmmm . . . I smell early retirement! DDH . . . all I can say is LMAO! Oh my goodness, that is awesome, but did you guys bag a big ol' yotie with it?